Established in 1979, Phil James is a small South Wales family partnership company. Many of the employees who worked alongside Phil back then are still employed now and it is estimated that there is a combined Upholstery experience between all the staff in the region of 150 years. Hence, the company is proud of its experience and combination of modern and traditional upholstery skills, which are offered to commercial customers and domestic customers alike. Continued expansion of the company and investment in manufacturing equipment has permitted the company to handle large scale seating projects with fairly impressive turnaround times, plus the flexibility and experience of the staff has lead to Phil James being involved in diverse appointments such as manufacturing the Doctors' chair for the Tardis. Health & Safety is an important issue to us within our working environment and when working on construction sites and all our site operatives are CSCS approved. 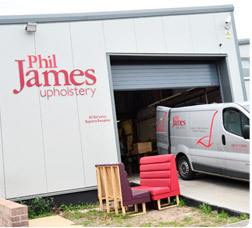 Customers who buy from Phil James are assured of dealing with professional people who care about the quality of upholstery workmanship and will deliver on time.